Patients and families who spend time on a Gillette inpatient unit might notice that traditional bedside rounding has a new look and feel. In August 2014, nurses began a concept called family-centered rounding. Piloted by the nursing collaborative governance clinical practice committee, family-centered rounding means that providers round with the patient’s nurse— and with the patient’s family present, whenever possible. Inpatient Rehabilitation Unit nurse Sarah Anderson, a member of the committee in 2014 and 2015, says the initiative aimed to enhance the hospital’s culture of patient-centered care. To prepare for the launch of family-centered rounding, team members researched different nurse-provider rounding methods, collaborated with provider groups, and communicated the concept to nursing units. After implementation, the team conducted regular audits on each inpatient unit. They also tracked patient satisfaction scores for five communication-specific survey questions to measure improvement. 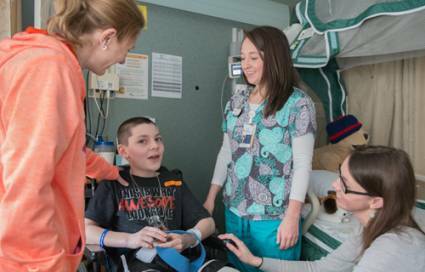 Photo (top left): Marie Miller, a nurse on the Inpatient Rehabilitation Unit, and Gabrielle Meyer, a pediatric rehabilitation resident, participate in family-centered rounding with Dalton Youngblood and his mom, Crystal Ludwig. 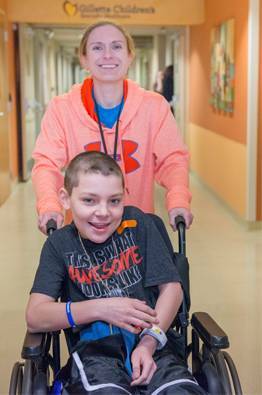 Dalton, 12, spent a month at Gillette recovering from Guillain-Barre Syndrome. Photo (bottom right): Dalton and his mom.